Osteoporosis causes the bones to become weak and brittle, increasing the risk of bone fractures, which in turn leads to increased morbidity, mortality and a reduction in quality of life. According to National Nutrition and Health Survey 2003 data, almost 80% of Filipino women and 60% of men aged over 70, are at high risk of developing Osteoporosis. prevention, diagnosis and treatment of Osteoporosis is quickly becoming a national health priority. NCP’s work in this area focuses on building bone mass at an early age. We conducted our first trial on calcium intake and exercise in 2009, working on the hypothesis that increasing calcium intake and weight-bearing exercise during childhood, improves peak bone mass reducing the risk of bone fractures later in life. The number of Filipinos at risk of Osteoporosis is projected to reach 4 million by 2020 and 10.2 million by 2050, according to National Nutrition and Health Survey 2003 data. 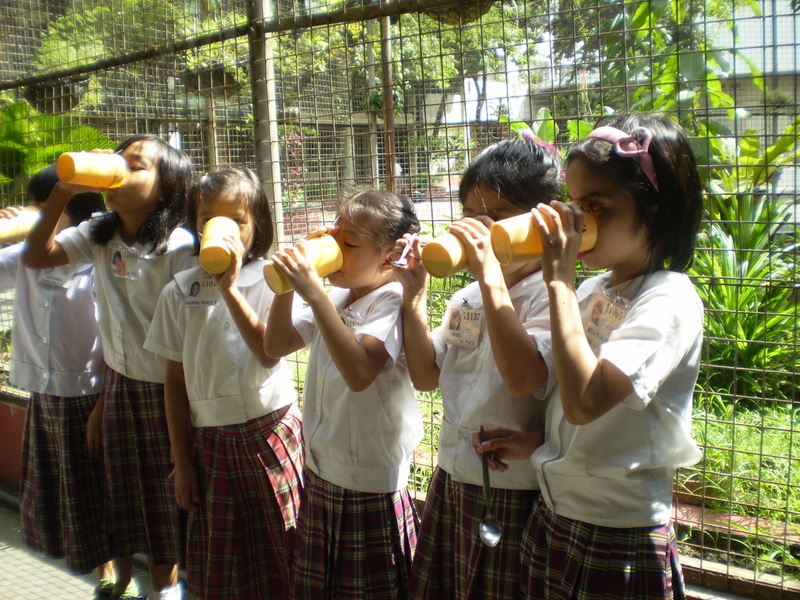 Primary school girls drinking high-calcium milk, as part of the Bone Health study. Primary school girls participating in weigh-bearing exercise, as part of the Bone Health study. Can an increased calcium intake and exercise among prepubescent girls have an impact on bone mineral content? This was the question we wanted to answer through our clinical trial, Bone Health: The effects of a 10 month school-based provision of high-calcium milk and weight-bearing exercise program on the bone mineral status of 7 to 9 year old pre-puberty girls. The study was conducted between 2009 and 2010, on the evidence that the accrual of bone mineral content in childhood may aid in reducing consequences of adult Osteoporosis. The results of this study would guide us in designing interventions that could increase bone mass at a young age and help mitigate the risks of bone fractures in later life. The trial, compared the effect of taking high-calcium milk (500mg per serving) verses low-calcium milk (57mg per serving), and weight-bearing exercise verses passive exercise on bone density. Two groups received X 2 servings of calcium-fortified milk every school day for the duration of the trial. Two groups received X 2 servings of non-calcium-fortified chocolate-flavored milk, every school day, for the duration of the trial. Half of the high-calcium milk drinkers and half of the low-calcium milk drinkers performed weight-bearing exercises daily for 30 minutes, for 10 months. While the other half of high-calcium milk drinkers and low-calcium milk drinkers performed a passive sit-down activity daily for 30 minutes, for six months, then performed a daily exercise program for 30 minutes, for the next four months. The bone mineral content (BMC) and bone area of the participants was measured using the Lunar DPX-IQ Densitometry Machine at the baseline of the trial, at six months and again at 10 months. The results of this trial will be presented in May, 2015, at the Asian Congress of Nutrition, in Japan.